And this means that, sooner or later, the proverbial wheels are going to fall off the bus. And it might be sooner. I don’t always agree with his policy recommendations, but I regularly read Desmond Lachman of the American Enterprise Institute because he is one of the best-informed people in Washington on the fiscal and economic mess in Europe. …while the euro could very well survive a Greek exit, it certainly could not survive in anything like its present form were Italy to have a full-blown economic and financial crisis that forced it to default on its public debt mountain. …Among the reasons that there should be greater concern about an Italian, rather than a Greek, economic crisis is that Italy has a very much larger economy than Greece. Being the third-largest economy in the eurozone, Italy’s economy is around 10 times the size of that of Greece. Equally troubling is the fact that Italy has the world’s third-largest sovereign bond market with public debt of more than $2.5 trillion. Much of this debt is held by Europe’s shaky banking system, which heightens the risk that an Italian sovereign debt default could shake the global financial system to its core. …the country’s economic performance since 2008 has been abysmal. Indeed, Italian living standards today are around 10 percent below where they were 10 years ago. Meanwhile, Italy’s banking system has become highly troubled and its public sector debt as a share of gross domestic product (GDP) is now the second highest in the eurozone. …today there would seem to be as many reasons for worrying about the Italian economy as there were for worrying about the Greek economy back in 2009. Like Greece then, Italy today checks all too many of the boxes for the making of a full-blown economic and financial crisis within the next year or two. …the Italian economy today is barely above its level in 1999 when the country adopted the Euro as its currency. Worse still, since the Great Global Economic Recession in 2008-2009, the Italian economy has experienced a triple-dip recession that has left its economy today some 7 percent below its pre-2008 crisis peak level and its unemployment rate stuck at over 11 percent. …deficiencies of its ossified labor market that contributes so importantly to the country’s very poor productivity performance. As a result, since adopting the Euro in 1999, Italy’s unit labor costs have increased by around 15 percentage points more than have those in Germany. …Italian banks now have around EUR 360 billion in non-performing loans, which amounts to a staggering 18 percent of their loan portfolio. If that were not bad enough, the Italian banks also hold unhealthily large amounts of Italian government debt, which now total more than 10 percent of their overall assets. …the country’s public debt level has risen from 100 percent of GDP in 2008 to 133 percent of GDP at present. …a government effort to promote “Fertility Day” on Sept. 22, a campaign intended to encourage Italians to have more babies. 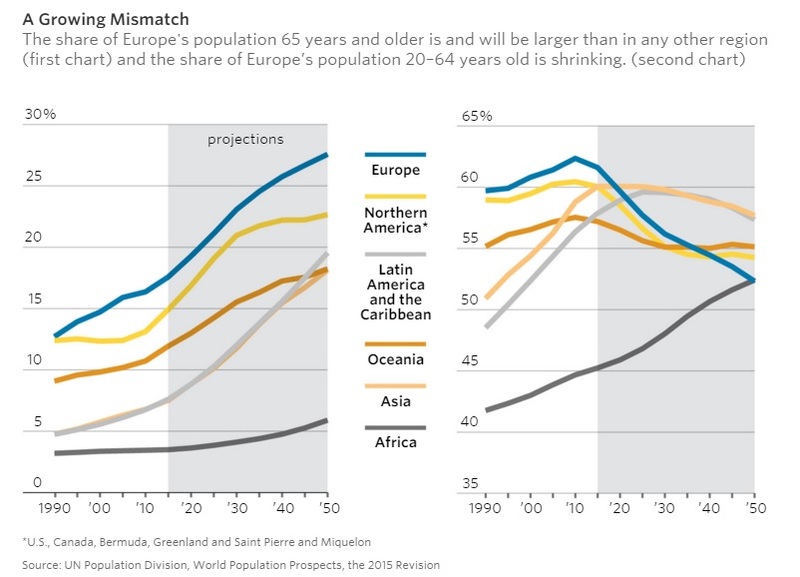 …Italy has one of the lowest birthrates in the world… Italian families have been shrinking for decades. In 2015, 488,000 babies were born in Italy, the fewest since the country first unified in 1861. It has one of the lowest birthrates in Europe, with 1.37 children per woman, compared with a European average of 1.6, according to Eurostat figures. The problem is not a lack of desire to have children, critics of the campaign say, but rather the lack of meaningful support provided by the government and many employers. …”I still feel very offended,” said Vittoria Iacovella, 37, a journalist and mother of two girls, ages 10 and 8. “The government encourages us to have babies, and then the main welfare system in Italy is still the grandparents.” …Italy’s government has tried to help families with a so-called baby bonus of 80 to 160 euros, or about $90 to $180, for low- and middle-income households, and it has approved labor laws giving more flexibility on parental leave. Italian school leavers may face the dismal prospect of 40 per cent youth unemployment, but at least they have one thing to look forward to – a €500 “culture bonus”, courtesy of the government. From next month, every 18-year-old will be entitled to claim the money and spend it on culturally enriching pursuits such as going to theatres, concerts and museums, visiting archaeological sites, and buying books. The scheme, which starts on Sept 15, will benefit 575,000 teenagers, at a cost to the government of €290 million (£250 million). …it has been welcomed by 18-year-olds, who face a difficult economic landscape when they leave school – high unemployment, a lack of secure, long-term contracts and an economy that has performed dismally for a decade. “Of course we’re happy…,” said Angelica Magazzino, a teenager from the southern region of Puglia who turns 18 in November. Italy’s highest court has ruled that masturbation in public is not a crime, as long as it is not conducted in the presence of minors. The decision came down from the Italian Supreme Court…in the case of a 69-year-old man…The man was convicted in May 2015 after he performed the act in front of students on the University of Catania campus, according to documents filed with Supreme Court. The man was sentenced to three months in prison and ordered to pay a fine of €3,200 (around $3,600). However, the defendant’s lawyer appealed the case to the country’s highest court, which ruled on the side of the accused in June but only just made its decision public. Judges ruled that public masturbation out of the presence of minors is no longer deemed criminal conduct due to a change in the law last year, which decriminalized the act. Julian – a long article but perhaps something in it of interest for you.